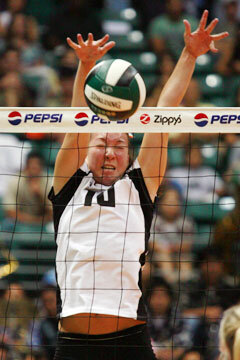 Rainbow Wahine setter Kanoe Kamana'o blocked a kill attempt by Cal Poly last night. Hawaii lost the match in five games despite 65 assists from its All-America setter. Yes, Cal Poly San Luis Obispo is THAT good. And THAT resilient. The No. 23 Mustangs, on the road for their fourth consecutive week, outlasted No. 12 Hawaii last night, holding off three Rainbow Wahine match points to pull out a 22-30, 30-21, 16-30, 30-24, 17-15 volleyball victory at the Stan Sheriff Center. A subdued crowd of 3,431 (6,155 tickets issued) saw the Rainbow Wahine lose a second consecutive match and drop a five-gamer for the first time in three this season, while the Mustangs upped their five-game record to 4-1. This win over Hawaii was bigger than Cal Poly's five-game victory over then-No. 8 Texas on Sept. 2, said Mustang coach John Stevenson. "It sounds corny, but it is so memorable to win a match like this on such hallowed grounds," Stevenson said. "Coach (Dave) Shoji is such an icon and a classy guy. It's an honor for me to bring a team to play UH. At the end of the day we get to play in one of the greatest venues for intercollegiate volleyball, against one of the people I respect the most, against one of the best programs in the history of volleyball." Cal Poly did it with 24 kills and 14 digs from Alicia Waller, and 23 kills and 15 digs from Kylie Atherstone to win the 2-hour, 34-minute marathon. And the Mustangs did it by refusing to fold, even down at 12-9 and 14-11. Wahine Jamie Houston thought she had put down her 28th kill to end it, but the ball was not ruled down and play continued, with the Mustangs also getting away with what looked to be a mishandled ball. Instead of it being over, the point went to Cal Poly (14-12) and the Mustangs held off another two match points to tie it at 14. 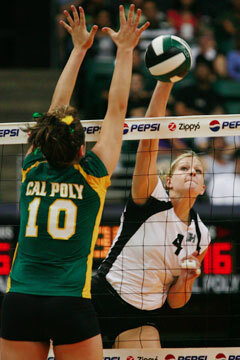 Kari Gregory of Hawaii attempted a kill against Ashleigh Bertoni of Cal Poly during last night's match. Juliana Sanders' 12th kill gave Hawaii another swing at ending it at 15-14. Cal Poly scored the final three points, blocking Sarah Mason and then having both Jessica Keefe and Mason hit out to hand the Wahine a loss perhaps even more disappointing than the one to Stanford last week. "This one hurts more than Stanford," Houston said of Hawaii's worst rally-score-era loss. "Because we played well. We just needed to finish it. "It hurts to lose in five when you had it in your hand." "We were very efficient until the end," Mason added. "It was hard to feel like you earned it and thinking about that it should have ended three plays ago. Maybe it was a lack of concentration. We just had a breakdown at the end." The soul-searching for Hawaii (5-4) continues tonight at 7 with the rematch against the Mustangs (7-3). Four Wahine were in double-figure kills, led by Houston's 27. Mason finished with 17 kills and 15 digs, Sanders had 12 kills and was in on seven blocks, and Kari Gregory had 10 kills. "We just couldn't make any plays at the end," Shoji said. "And all we needed was one and they got the one we needed. "It was probably the best match of the year for us in terms of putting together streaks. But we should have closed it out. "They're a proven good team with quality players. The teams are evenly matched and I think tomorrow will be another tough match. The team that is the toughest mentally will win." Game 2 was going smoothly for the Wahine, as they enjoyed a 19-17 lead without committing a hitting error in 25 swings. The Mustangs caught them at 20 and -- two hitting errors, two aces and two timeouts later -- the Wahine saw themselves down 27-20. Cal Poly closed out the 13-2 run with three unanswered points and what seemed to be a ton of momentum. Hawaii flopped its lineup to get better matchups and flipped the momentum right back. Note: Sophomore middle Nickie Thomas tweaked her right knee after giving Hawaii a 23-17 lead in Game 1. Whether she will be cleared to play tonight will be determined today. Aces -- Cal Poly (5): Suttich 2. Hinkle, Hayes, Waller. Hawaii (6): Houston 2, Mason 2, Lee 2. Assists -- Ca Poly (63): Hayes 58, Atherstone 3, Bertoni, Paperny. Hawaii (77): Kamana'o 65, Keefe 4, Lee 2, Thurlby 2, Woolford, Mason, Gregory, Duggins. T -- 2:34. Officials -- Dan Hironaka, Dixon Chun. A -- 3,431.